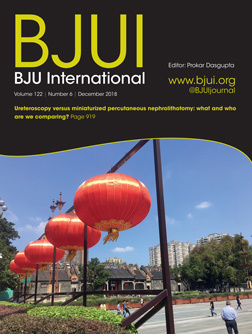 The article of the month for December 2018 is on work carried out in Guangzhou, China: Super‐mini percutaneous nephrolithotomy vs retrograde intrarenal surgery for the treatment of 1–2 cm lower‐pole renal calculi: an international multicentre randomised controlled trial. Guangzhou, on the River Pearl, is the capital of Guangdong in Southern China. It is a major port and transportation hub, and was known as Canton to early European traders. The current population is estimated to be >13 million making it China’s third largest city. The climate is sub-tropical monsoon giving hot humid Summers and mild dry Winters and a city blooming with flowers all year round.